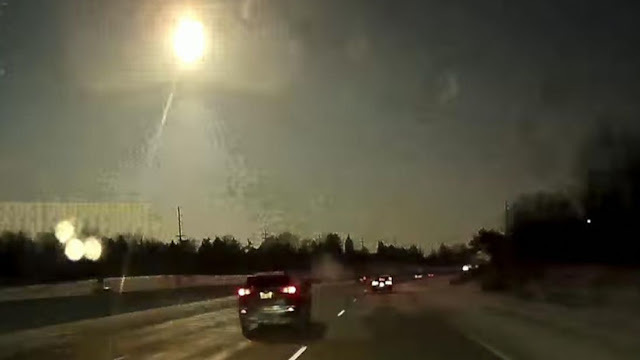 Watch meteor light up Michigan sky (17 January 2018). Video Source: Youtube. WXYZ-TV Detroit Channel 7 report: National Weather Service: Bright light, loud sound over SE Michigan was 'a likely meteor' (16 January 2018). Video Source: Youtube. METEOR SIGHTING IN MICHIGAN **We found the crash site** (16 January 2018). Video Source: Youtube. Like a real life X-Files episode, two guys heard the meteor impact, got in their car, and searched for the Michigan meteorite crash site. They posted what they found in Taylor, Michigan on social media (above). Notice that they automatically assumed that the cause of the meteorite was aliens. Their social media report was later dismissed by local news as a garage fire. There have been a lot of civilian cellphone captures of similar incidents this month, including a giant green fireball in Indiana at 11:45 p.m. on 17 January 2018, and a huge smoking meteor impact crater next to a highway near Torreón, Mexico on 18 January 2018. On 18 January, there was an enormous boom near Steamboat Springs, Colorado. There was another unexplained boom reported in Magnolia, Arkansas on 20 January 2018 at 4:30 p.m. A third boom on 21 January in Wyomissing, Pennsylvania was made even more odd by the fact that the date stamp of 12:01 a.m. 21 January on the report occurs before the time of the reported incident at 12:40 p.m. 21 January by over 12 hours. Of course, that discrepancy can be explained many ways, including the possibility that this is disinformation. These meteors do not seem to be related to any meteor shower, but Sky and Telescope confirms that the last major meteor shower was the Quadrantids, which peaked on 3-4 January 2018 in the northeastern sky of the northern hemisphere, with a radiant in the constellation Draco. The Quadrantids are associated with asteroid 2003 EH1, an extinct comet. IMPACTO DE METEORITO EN TORREON MEXICO, AUTORIDADES NO EMITEN EXPLICACION ALGUNA!! (19 January 2018). Video Source: Youtube. Check out the security system password reveal in Hawaii at 8:11! What Really Just Happened Over Michigan? (17 January 2018). Video Source: Youtube.